He was there outside the Sher-E-Bangla National Stadium and waited for close to seven hours. There’s hardly any doubt that Shakib Al Hasan is one of the most popular cricketers in Bangladesh, if not the entire cricket world. He has ruled amongst the top players in the International Cricket Council’s rankings and has been equally effective in all the departments, churning out some match-winning shows. The love for Shakib was seen a few months ago when he was recovering from a finger injury. The experienced campaigner didn’t play a part of the Asia Cup and was out of the series’ against Zimbabwe as well. In the meantime, Umme Ahmed Shishir, Shakib’s better half posted a picture on the social media where people can be seen offering prayers together in order for the cricketer to attain fitness at the earliest. Quite expectantly, people’s gesture for her husband mesmerised Shishir. Another instance of love and admiration for Shakib has come to the fore. He is currently playing for Dhaka Dynamites, who qualified for the final against Comilla Victorians in this edition’s Bangladesh Premier League (BPL). A fan came from Faridpur to Dhaka in order to get a glimpse of the dynamic cricketer. He was there outside the Sher-E-Bangla National Stadium and waited for close to seven hours. The distance from Faridpur to Dhaka is approximately 125 kilometres. Just when Shakib was about to board the bus, a person made him aware of the supporter. Subsequently, the Jessore-born all-rounder got down and called the fan. With joy in his heart, he went up to his hero and touched his feet. 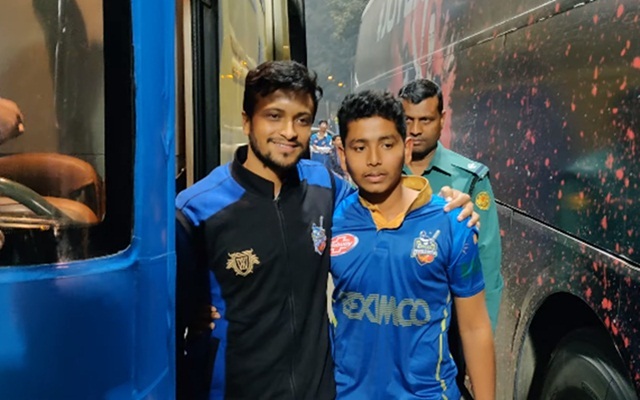 Shakib was a tad bemused by the heartfelt gesture and thereafter, he clicked a picture with the supporter. The fan was then asked about how he felt about the meeting and he called it to be his only wish and didn’t have enough words to describe the moment. Two of his friends from behind patted on his back, saying that he liked it to a large extent. Shakib’s team will play the final tomorrow and Shakib’s lovers would be hoping that the Dynamites win their fourth championship in the T20 tournament.